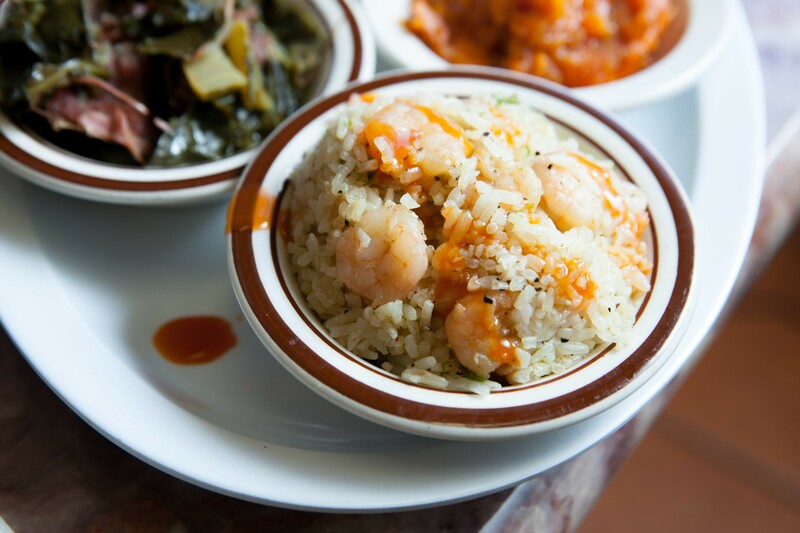 New Orleans-style soul food that is the real deal. The fried fish po'boy (left) and the shrimp rice were two standouts. Hours: Mon.–Sat. 11 a.m.–9 p.m., Sun. 11 a.m.–8 p.m.
Oakland has no shortage of restaurants that wear their Town pride on their sleeves — a Warriors' pennant on the wall, perhaps, or one of those This Is Oakland tourist guides propped open on the counter. But Big Momma's Kitchen, a new family-run soul food spot in East Oakland, belongs in a category all its own. 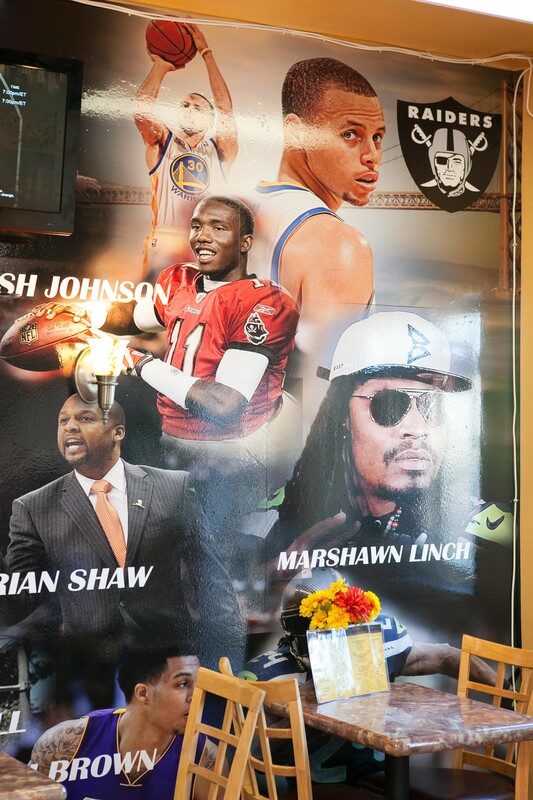 One side of the restaurant is papered with a glossy, wall-length photo collage of professional athletes with Oakland roots — Bill Russell, Jason Kidd, Marshawn Lynch, and a dozen more. On the opposite wall, another collage functions as a who's who of Oakland music (Hammer, Too $hort, En Vogue, and Tony! Toni! Tone! in all their glory), and a painting that memorializes the Occupy Oakland port shutdown, complete with the ghost of Malcolm X looking on beatifically from above. The over-the-top boosterism has a certain charm, as does the bright, cozy-cafe vibe. But for all of the Oakland paraphernalia, New Orleans is the city to which Big Momma's traces its culinary roots. Germane Thaxton, a manager at the restaurant, explained that chef-owner Isabella Coffey, aka Ma Bella, is a New Orleans native who has spent her past thirty-plus years in Oakland cooking, on and off, at local food festivals and for a soul food delivery service. Big Momma's, her first restaurant, is located on a stretch of International Boulevard just outside the heart of the Fruitvale district, where taquerias and torta shops constitute the vast majority of the dining options. The Oakland boosterism has a certain charm. But my favorite parts of the sandwich also happened to be the most lowbrow: the oozy layer of melted American cheese that clung to each piece of fish and the (non-traditional) soft sesame bun. The pleasure of the po'boy lay in its contrasts — the coolness of the creamy remoulade and uncommonly fresh lettuce and tomatoes against the piping-hot fried fish, whose exterior crunch made for a nice foil to the softness of the bread. Taken all together, it was like eating a suped-up, non-evil, extra-delicious version of a McDonald's Filet-O-Fish sandwich — high praise if you like that kind of thing. A fried shrimp po'boy made up of similar components was just as good. 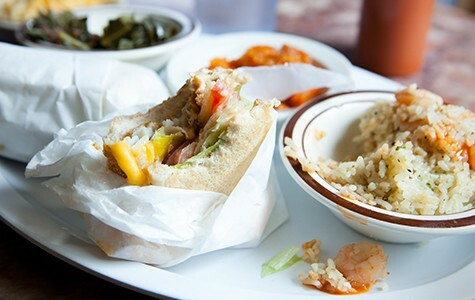 Aside from the po'boys, much of the rest of the menu at Big Momma's consists of the standard array of dishes that you'll find at any other soul food restaurant in town. It's the kind of place where there's a big pitcher of Kool-Aid in the fridge, and where desserts tend to be versions of classic Southern recipes, like pound cake made with 7-Up. One point of distinction is that all of the meat is Halal-certified, a fact that may be of interest to both practicing Muslims and those looking for meat of slightly better provenance than the factory-slaughtered stuff sold at, say, your run-of-the-mill fried-chicken joint. Here, the fried chicken was better, and juicier, than average — fried until the skin blisters and puffs out, then dusted with Cajun spices. Go for the thighs and legs, though; the one time I ordered the "party wings," they were overly salty. The smothered turkey wings are also worth ordering. These were cooked low and slow, as they ought to be, until the meat came clean off the bone with just a nudge, and the skin took on that lush, falling-apart quality that is the hallmark of this dish. But I missed the rice and big scoop of gravy that typically comes standard with these wings — eating them naked, perfectly cooked though they were, felt a little bit sad. Meanwhile, the sides at Big Momma's ranged from just passable to amazingly good. I had high hopes for the red beans and rice, given that they're a New Orleans staple, but the beans were oddly thick and starchy, so that the gravy just kind of sat on top of the rice instead of soaking in and infusing them with meaty flavor. And the mac 'n' cheese was that gloopy, congealed-cheese laden style that tastes good hot out of the oven, but not so much when scooped out of a warming tray, like it is at Big Momma's. On the other hand, the collard greens, prepared with Halal-friendly smoked turkey leg instead of pork, were pitch perfect — juicy and seasoned just right. Big Momma's signature shrimp rice. As is the case at so many traditional soul food restaurants, the food at Big Momma's takes a long time to come out. And the dish that took the longest of all — the shrimp rice listed as the restaurant's "signature" side — turned out to be the single most delicious item on the menu. More similar in appearance to an Asian fried rice or Italian risotto than the soupy, tomato-based dish you might imagine when you think of a New Orleans shrimp and rice, this is a dish whose aromatic foundation is what's known in Cajun and Creole cooking as the Holy Trinity: green bell pepper, onion, and celery, all chopped very fine. Add to that a healthy dose of garlic, some kind of red-tinged, shrimp-flavor-infused oil, and a handful of plump shrimp, and you wind up with an insanely rich and flavor-packed combination. I'd serve it for Thanksgiving in a heartbeat if I could figure out the recipe. Two months in, Big Momma's is still in soft opening mode, which means it hasn't yet hired and trained enough staff to start opening early for breakfast (shrimp and grits, anyone? ), as it plans to do eventually, or to launch its late-night takeout window. It also means that several of the dishes that are more unique to New Orleans aren't regularly available. I kept eyeing the fried oyster po'boy on the menu, but for now it seems as if it's only available off and on — off during both of my visits, sadly. Same goes for the jambalaya; I only knew about it because some Yelp reviewer had posted a picture. One of the specials I did get to try, the oxtails, showed off what Big Momma's touts as its "clean, fresh" approach. Most of the time, that's just so much talk. But this was a dish that walked the walk: tender meat with the sticky, chewy, gelatinous texture that any oxtail lover will appreciate. But instead of the usual flour-thickened, murky-gray gravy, these oxtails come topped with a little flurry of chopped parsley, and the rice underneath soaked up a mixture of meaty juices and soft-cooked onion and carrot. It was as much like a French pot roast au jus as it was a traditional Southern oxtails preparation — not necessarily better, but different from what I expected, and very, very good. In Oakland, that's the kind of cooking that feels right at home.